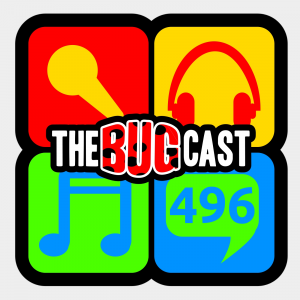 This week on The Bugcast: We raise the music level from “substantial” to “awesome”, cover some key news stories of the week, and play 8 great tracks of independent and Creative Commons music from Modern Pitch, Josh Woodward, Sticky Tickets, Ay-14ice, Seba Lay, Binärpilot, Bitter Mystics, and Arthur Lee Land. This week on The Bugcast: the kids try and take over after a sugar injection which quickly deteriorates into hysteria. Plus, we play 8 fantastic tracks of independent and Creative Commons music from Million Sins, The Easton Ellises, Nick Tann, Kaceo, Ay – 14ice, About Poetry, The Trembling Turncoats and Candice Russell. This week on The Bugcast: A new podcast from our Canadian contingent, a push for 300, and 8 great tracks of independent music Final Minute, Two Spot Gobi, Sadme, Mobtown Moon, Luke Spark, Ay-14ice, Avalanche and YUCA. This week, we really struggle to get through the show! Aside from an elongated chat segment, we do also play 8 really good pieces of music from Interlude, Ay-14ice, Final Minute, Old Remedy, Willows, Like Everybloody Nose, Basement Skylights and The Wind Whistles.